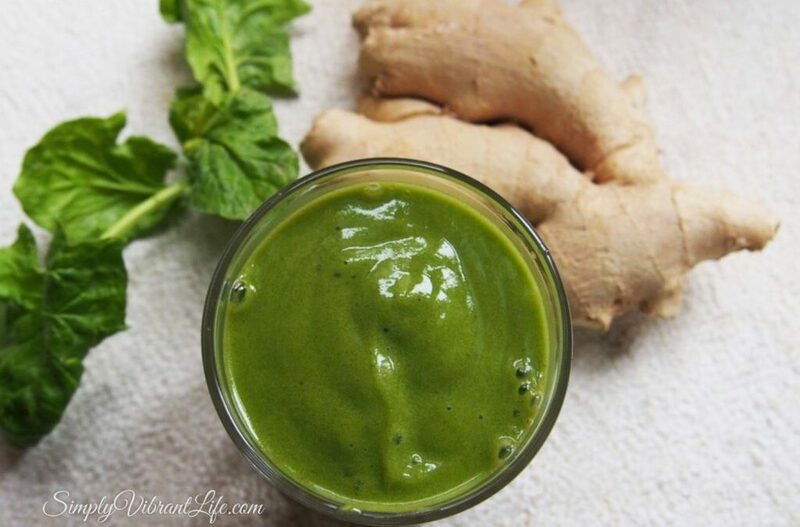 Making a no bloat smoothie is easy when you know why we are getting bloated in the first place. We have all been there – you get all excited about making a healthy smoothie, get out your super-duper healthy ingredients, mix them all up, enjoy your tasty and extra healthy meal and then boom – here comes the gas and a balloon belly! Why!? You are going to find it out from this article. Plus, get a simple guide on how to create no bloat smoothies. If you would prefer to get a solid raw vegan diet plan for spring for a whole month, full of bloat-free recipes, you can get it here. Bloating occurs when our digestive system fails to work efficiently. One of the surest ways to mess up your digestion is to mix ingredients that require different digestive juices and different digestion time. Fat and protein are much harder to digest than simple carbohydrates and require much longer time in our stomach. If we mix fat (avocados, oils, etc.) and protein (nuts, seeds, protein powders, etc.) with simple carbohydrates (sweet fruit), we are creating a messy traffic jam. Our body will keep fat and protein in the stomach for several hours to digest it, and if there is any fruit present in the mixture, it will start fermenting, leading to indigestion, gas and bloating. When we eat fruits together with most vegetables, we are very likely to get gas and bloating. The reason for that is a different type of fiber in fruits and vegetables. While fruits contain water-soluble fiber that is quick and easy to digest, vegetables contain mostly insoluble fiber, which tends to spend much longer time in our stomach. So if you eat veggies together with fruit, the whole mix will stay in your stomach long enough for the fruit to start fermenting. The same story – gas and bloating. You can get bloated if you eat a fruit smoothie after a fatty, veggie, protein-rich or cooked meal. If you are eating your smoothie before your last meal left your stomach, your smoothie will be stuck in your stomach until the previous meal digests all the way. Result – gas and bloating! How long does it take to digest a substantial meal? It depends on how complicated it was, how much protein, fat and insoluble fiber it contains and also, on how healthy your digestive system is. Protein powder might be making you bloated and doesn’t belong to a no bloat smoothie. Protein powders are in most cases unnecessary. We get enough amino-acids (protein) from green leafy vegetables. For any protein to be absorbed it needs to be broken down into separate amino acids. (2) So it’s easier for the body to break down shorter chains of amino acids. Starch in bananas requires the alkaline environment to digest correctly. If we mix bananas with acidic fruit, the digestion will be compromised. Result – … yes, you guessed it, gas and bloating! 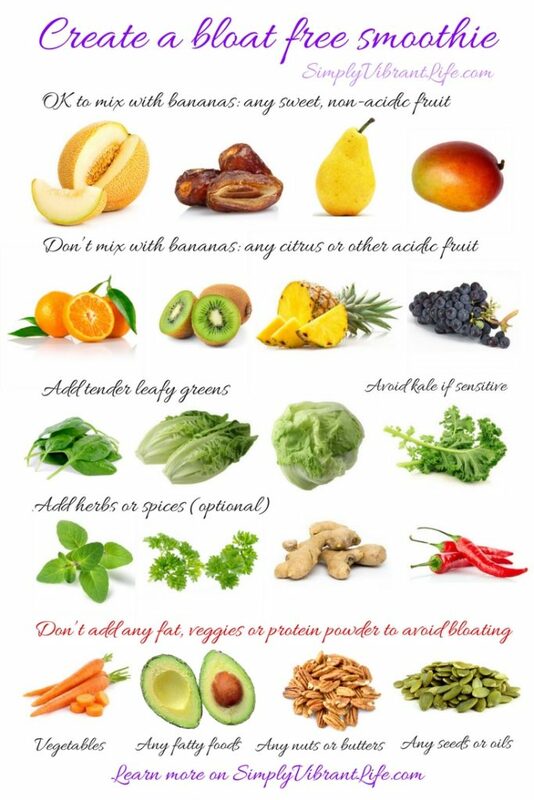 Always keep all the acidic fruit separate from bananas in your no bloat smoothie. Unripe or overripe fruit can also give you gas and bloat. Too much starch in unripe bananas makes them difficult to digest. Unripe apples, peaches, pears, etc. are too acidic and if you mix them with bananas will create problems with digestion. Even fiber in unripe fruit is different and harder on digestion than ripe fruit’s fiber. Most fruit is sold unripe, but you can ripen it at home. Only then you can create a truly no bloat smoothie. Overripe fruit is often contaminated with fungus, which might also cause gas and indigestion in sensitive individuals. Eating too fast or gulping your smoothie down. Chop some whole fruit in your smoothie, eat it with a spoon and chew mindfully. Your meal digests much better when you are enjoying it! Don’t add any avocados, olives, coconuts, nuts, seeds, protein powders or oils to your sweet smoothie. Keep fruit separate from vegetables. If you still get gas and bloating from green smoothies, avoid tough greens, like kale and prefer tender greens, like spinach and lettuce. Only eat your no bloat smoothie on an empty stomach. Only use ripe fresh fruit. Keep bananas separate from any acidic fruit. Chew your no bloat smoothie mindfully. To make a green smoothie, you can use any fruit and greens you like. Just keep in mind all the recommendations in this article. I also recommend keeping your smoothies very simple. 2-3 types of fruit and 1-2 types of greens are plenty. If you wish, you can add a few herbs to your smoothie for additional detoxifying effect. NB! Be careful with adding too many herbs, listen to your body’s reaction! To learn more about healthy food combining and to get over a hundred bloat-free raw vegan recipes, you can get our “Simply Vibrant Recipes” e-book here. NB! Reny is not a dietitian or medical doctor. Any advice given by Reny on simplyvibrantrecipes.com blog is her personal opinion only and should not be taken as medical advice.